Almost everyone who is a quilt-lover has woken up one day and suddenly noticed that their favourite quilt that they love to bits and use every day no longer has that same pristine newly made appearance as when they first bought or made it. Perhaps the quilt has been sat on every day of the week and it no longer looks quite as clean and even, or maybe it was just finally time to wash the quilt just had to be washed and now it is dry it still looks like it has those newly-washed crumples! Whatever has happened there is no need to worry about it, as even if the quilt looks like it has been crumpled up at the end of the bed just one too many times, more often than not a little careful ironing and pressing can restore almost any quilt back into as-new condition. It is important to first find out the types of fabric used in the construction of both the quilt top and the binding. If you know that the quilt is made of durable fabrics such as cotton then it is possible to use a hotter temperature when ironing. A hotter iron temperature will make the overall pressing task much easier but it can be damaging to delicate fabrics. Be careful to only use a very mild iron temperature when synthetic fabrics or blends are involved! Also consider the material used as batting in the quilt. Remember that synthetic materials are particularly sensitive to heat and also consider the effect that steam may have on the material if you are using a steam iron. Dry-ironing is usually the preferred method of pressing a quilt. If steam ironing is used the batting can sometimes get damp and not dry out properly. If this happens then you run the risk of the batting material rotting or deteriorating over time. An alternative to steam ironing is to dry-iron the bulk of the quilt and then use a small spray bottle of distilled water to gently spray any particularly stubborn creases that cannot be removed by dry ironing along. This mean you get the benefit of steam ironing but minimise the risk of causing damage to the batting. 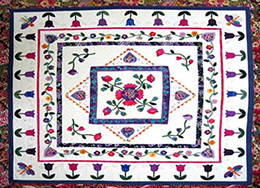 Is your quilt a plain patchwork quilt or was appliqué or embroidery used in its construction? Quilts with additional appliqué patterns or delicate embroidery work should be treated with particular care when ironing so as to not catch corners of the fabric on the iron or accidentally burn the embroidery thread. This can be particularly easy and quick to to do if your iron is hot! One useful technique for ironing quilts with embroidery or appliqué or that are made of sensitive synthetic materials is to place a sheet of cotton over the quilt. Ironing through the cotton will help prevent fabric sticking to the base of the iron and result in a gentler transfer of heat. Don’t forget to consider the age and condition of the quilt. For vintage or antique quilts it may be better to get a professional with experience in handling such quilts to do the pressing for you. It is often worth a few dollars for the piece of mind that your quilt will not be accidentally damaged!